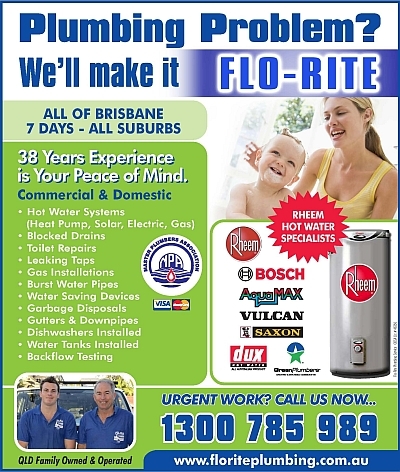 Flo-Rite Plumbing is a family owned specialist Plumbing and Hot Water Company operating for 29 years in Brisbane and on the Gold Coast. Our reputation has been built on providing prompt, quality service at competive prices. We are the hot water specialists. If you are looking for a water heating solution, we offer the advice you need to make an informed decision. Whether you need emergency hot water repairs or replacement hot water systems we offer the best hot water system prices. We are fully Licensed and Insured Solar Hot Water, Gas Hot Water, Heat Pump Hot Water and Electric Hot Water system specialists as well as Plumbers, Drainers and Gas Fitters. All of our trade staff have Plumbing, Electrical and Gas Fitting Licences. We are equipped to carry out repairs or replacement of all major brand Hot Water Systems like Rheem, Vulcan, Dux, Bosh, Aquamax, Saxon, Quantum,Zip, Pyrox, Beasley, Supakwik and more. We offer hot water solutions tailored to suit your changing needs and are an accredited service and warranty agent for all leading brands. Working closely with manufacturers & energy authorities will ensure our products are of the highest standards & up to date with changing regulations. If you need 7 day 24 hour emergency service or just some general tapware or toilet repairs, Flo-Rite Plumbing guarantee our friendly and courteous plumbing, hot water, gasfitting and drainage staff are committed to fixing your service requirements promptly.